The Commission approves an application by Clear Sky Radio Inc. to operate a commercial FM radio station to serve Cranbrook with transmitters in Fernie, Sparwood and Invermere. The Commission denies an application by Newcap Inc. to operate a commercial FM radio station to serve Cranbrook with a transmitter in Fernie. New research from the University of Sydney Voice Research Laboratory in Australia has discovered unique vocal cord vibration patterns might be the secret behind a good radio voice. The world-first study filmed the vocal folds of 16 male radio performers, including announcers, broadcasters, newsreaders and voice-over artists and found their vocal folds move and close faster than non-broadcasters. Speech pathologists, Dr Cate Madill and Dr Samantha Warhurst from the Faculty of Health Sciences, said the research reveals radio performers close their vocal folds with greater speed and force than non-broadcasters. This may be because they have better control of the tension in their vocal folds while speaking. “Most radio voices are unique in their depth, warmth or resonance but until recently we have been unable to pinpoint what is happening physically with the vocal folds to achieve these qualities,” Dr Madill said. You can read more about this research study here. Thanks to radio Info from tipping us off to this story. There was an interesting article published yesterday (16 July) about HD radio in the USA and the level of coverage HD is getting in compassion to the FM signal. The author is Ian Jurison who is the senior operations engineer for Clear Channel. In the United States, many broadcasters have employed HD Radio. While the initial focus of many broadcasters implementing HD Radio was to provide digital audio delivery to consumers, this emphasis has expanded in recent years. Data services delivered over HD Radio are an exciting and growing development in the industry. All of the emphasis for data delivery via HD Radio has been on the FM band, as the data rate starts at 96 kilobits per second in standard MP1 hybrid mode. The audio channels on HD Radio use adjustable bitrate codecs, so the bitrate of the audio channel(s) can be reduced slightly to allow for additional data services in MP1. The available bandwidth in the hybrid system increases from 96 kbps, to 124 kbps in MP3 mode, and up to 149 kbps in MP11 mode. Most automotive manufacturers are now including HD Radio in many of their latest vehicles. Data services could be considered in some ways a gateway to an increased adoption rate of HD Radio in the automotive environment. 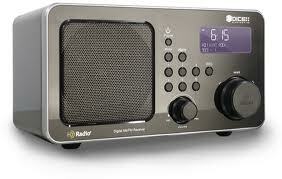 Because of the increasing receiver base for HD Radio, and the growing importance of data delivery via HD Radio (e.g. Artist Experience, traffic data, etc. ), this paper hopes to add to the technical record the tangible benefits of elevated digital power. Background Digital Power Level The Federal Communications Commission first authorized the use of the hybrid HD Radio IBOC system in its First Report and Order, dated October 10, 2002. (MM Docket 99-325, FCC 02-286). This authority was expanded in its Second Report and Order, dated March 22, 2007 (FCC 07-33), where many of the engineering specifications of the system and operating conditions that are in use today were finally codified into official rules and regulations. The initial average power level selected for the digital carriers was 1 percent of the analog effective radiated power (ERP) level of the host station, or -20 dBc. Much testing was done with input from multiple parties to select a power level that provided what, at the time, seemed to be an effective digital coverage area, while at the same time balancing concerns about interference to adjacent FM stations. Unfortunately, after many stations had adopted the FM hybrid system at the initial -20 dBc operating power level, it became apparent that the digital coverage did not fully replicate the analog coverage, particularly in mobile edge-of-coverage and indoor environments. Many of the initial parties began researching and testing the use of elevated digital power levels in 2007. In 2008, a formal request was submitted to the commission to allow a blanket authorization to increase digital carrier power to 10 percent of the analog power, or -10 dBc. The request for a power increase caused considerable debate within the industry. The end result was the Commission’s Third Order dated Jan. 27, 2010 (DA 10-208), which was a compromise between those requesting a blanket -10 dBc authorization and those who wanted no potential additional interference with levels remaining at -20 dBc. This order established a blanket authorization of increased digital power to -14 dBc for most stations, a procedure for some stations to increase from -13.9 dBc to -10 dBc with a special engineering exhibit and a special procedure for grandfathered super-powered stations. Current State of Elevated Power Operations These rules have been in effect for more than four years, and the amount of real-world testing and experience with elevated powers continues to increase as stations invest in upgrading their transmission facilities to achieve higher digital powers. As of Jan. 7, 2014, the commission reported that 50 FM station licensees had increased digital power between -13.9 dBc and -10 dBc. Ten super-powered FM stations had requested increases. Five or fewer broadcasters have applied for experimental authorizations of asymmetrical side band power authorization. (Kamloops, B.C.) – The Jim Pattison Broadcast Group Limited Partnership (Pattison) and Rawlco Radio Ltd. (Rawlco Radio) subject to CRTC approval today jointly announced Pattison’s acquisition of nine radio stations (and related assets) located in Northern Alberta and Saskatchewan. The current local management teams will continue to lead the Edmonton, Prince Albert, North Battleford and Meadow Lake stations and all of the existing team members at the nine Rawlco Radio stations will be offered positions and the opportunity to grow with the Jim Pattison Broadcast Group. Rawlco Radio will continue to hold their existing seven radio licences in Saskatoon, Regina and Calgary. The sale is subject to approval from the Canadian Radio-Television & Telecommunications Commission (CRTC), for which an application was recently submitted. This sale follows the successful recent Pattison acquisition of three Bell Media radio stations in Calgary and Winnipeg (CKCE-FM, CHIQ-FM & CFQX-FM) and the launch in April 2014 of the much anticipated CHPK-FM in Calgary and the Alberta Peak Performance Project.